It is first day at school for the Palestinian Bedouin children of the Jahalin community, in the Judean Desert, but this year is different. They resume their studies in a new school building built of bamboo. The new “desert school” of the Wadi Abu Hindi community is the last project of the Italian NGO Vento Di Terra and the group of architects “Arcò”. In fact, the story of this school finds its roots longer in the past. The community, displaced by the new born Israeli state from the Negev in 1948, resolved to build a school in 1997 as a response to their dramatic demographic growth. In 1994 the signing of the Interim Oslo Accord placed their community into ‘Zone C’ an area of Israeli civilian and military control. Thereafter, the homes and the school were twice demolished, before the Israeli Court of Justice ruled the demolitions illegal, and granted the community a temporary permit of reconstruction. Like most of the constructions in Bedouin villages in area C, the school was a metal sheet structure which becomes unbearably hot. Despite these harsh conditions, the school has 120 children pass through its doors every year. “Vento di terra”, specialized in the use of alternative construction materials, to improve the conditions of the users of the school. The photo feature was realized by the photographers Andrea and Magda. 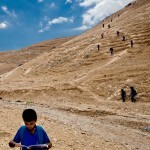 The “Desert school” project faced particular restrictions imposed by the Israeli military authority, which state the maintenance of the existing situation. In addition to the thermal insulation issue, the insufficient acoustic insulation between classrooms didn’t allow a correct lessons’ course. The solution found by the NGO to respond to all these challenges was the use of bamboos, associated with an internal insulation with earth and straw. The project approach is rooted in a relationship of mutual trust, created by Onlus Vento di Terra with the local communities. These last ones play an active role in the decision making process until the organization and concrete realization of the project. All these aspects are of fundamental importance in a general process of identity making for each new building. In this way we also have the result of promoting local occupation and job training for new building technologies. Technical and architectural decisions, taken by the Arcò team, have the purpose of retrofitting the existing building and transforming it into a new one, which is climatically comfortable and energetically sustainable. Respecting the centuries old history that has seen the Bedouins crossing the deserts of the Middle East, which continues to this day, dozens of kids cross the mountains by foot or with their inseparable mule to go from home to school. As soon as the bell announces the end of the school, a long line of children and mules disappear into the Palestinian desert. Andrea M. and Madeleine C. are photographers documenting the school of bamboo that has just been inaugurated for Bedouin children of the Jahalin community. Read other articles by Andrea M. and Madeleine C., or visit Andrea M. and Madeleine C.'s website. This article was posted on Tuesday, October 26th, 2010 at 7:00am and is filed under Children/Youth, Education, Israel/Palestine, Students.